Ya’ll know how much I love good smelling things, right? Well, this one is going to knock your socks off! 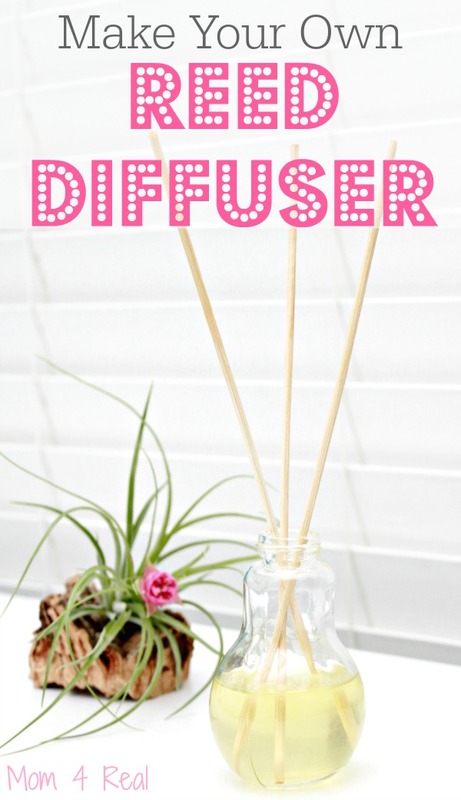 You know those super cute reed diffusers that they sell all over the place now? You can totally make your own! And, holy cow…they smell amazing! 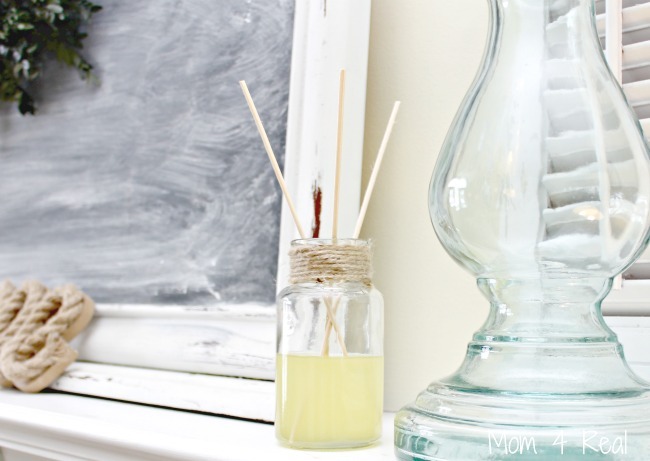 I’ve made six of my own homemade reed diffusers so far and spread them all over my house…especially in the bathrooms! The scent that they give off is so fresh and natural instead of those strong store bought ones that give me a headache and trigger my allergies! Let me show you how easy it is to make your own! 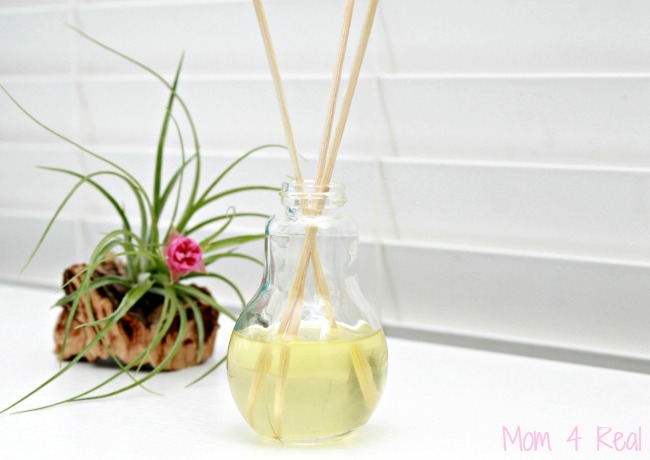 You will need a small glass container with a small opening at the top, rattan reads that can be purchased at Michaels, 1 tablespoon of isopropyl alcohol, 1/3 Cup of almond oil and 15 drops of essential oils in the scent of your choice. I used lavender oil for this one! 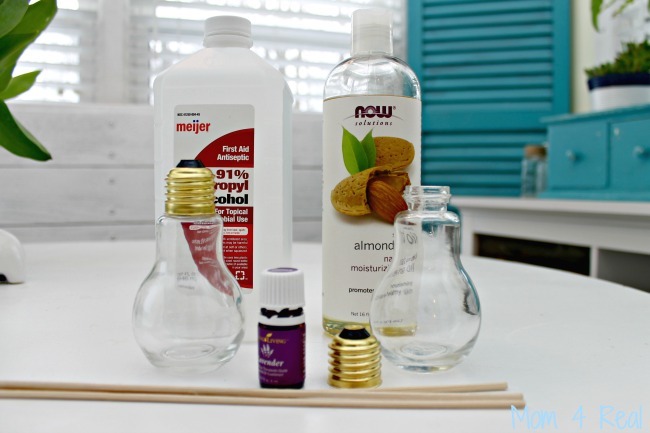 Pour the almond oil and isopropyl alcohol (which helps the almond oil thin out a bit so it will permeate and travel up the reeds) into your container, add 15 drops of your essential oils, then give them a little stir. Next, add 3-5 rattan reeds to your container and move them around a little. The oils will take an hour or two to move up through your reeds, then you will be able to smell the scent that it gives off. I especially love the ones in our bathrooms because when you open the doors, you don’t get hit with musty bathroom smell, instead it’s nice and fresh! The other great thing about these amazing reed diffusers is that they are super cute, so they won’t take away from your room’s decor! 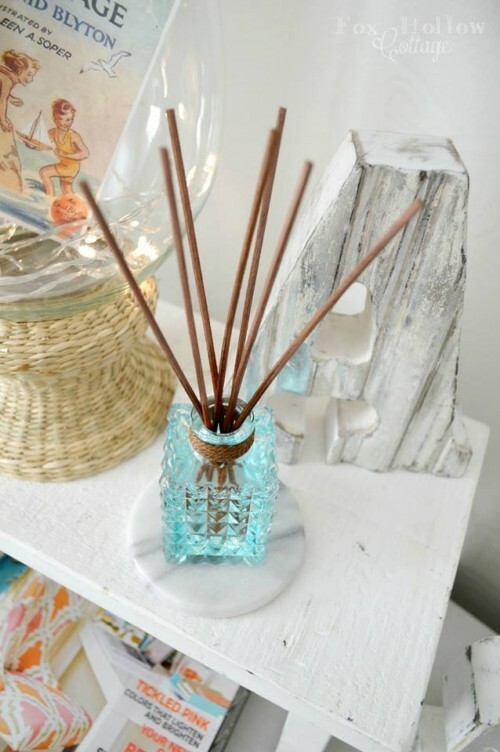 My friend, Shannon from Fox Hollow Cottage made this super cute one using an aqua glass container, and she made her own custom scent…super cute, right?